This Easy Broccoli Casserole recipe is a simple side dish that comes together with a handful of pantry staples. 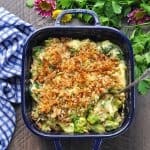 You can use fresh broccoli or frozen broccoli, and you can create a healthy broccoli casserole with just a few simple substitutions. Preheat oven to 400 degrees F. Spray an 8- or 9-inch square baking dish with cooking spray and set aside. Cook broccoli in microwave, just until crisp tender (about half of the time called for on the package). You don’t want to cook the broccoli until it’s soft because it will continue cooking when you bake the casserole. Place broccoli in colander to drain. In a small saucepan over low heat, stir together condensed soup, cheese, and lemon juice, just until cheese melts. In a separate bowl, whisk together egg, mayonnaise, and grated onion. Combine broccoli, soup mixture, and egg mixture. Transfer to prepared baking dish. In a small bowl, stir together dry stuffing mix and melted butter. Sprinkle on top of the casserole. Bake for 15-20 minutes, or until heated through and topping is golden brown. Prep-Ahead: You can assemble this casserole in advance, through Step 5. Cover tightly and keep in the refrigerator for up to 1 day, or in the freezer for up to 3 months. Bake according to instructions above. If baking from frozen, you will need to add a few minutes to the baking time to make sure that the casserole is completely heated through. Skip the topping completely! You can omit the buttered stuffing mix or Ritz crackers if you want a Keto Broccoli Casserole!